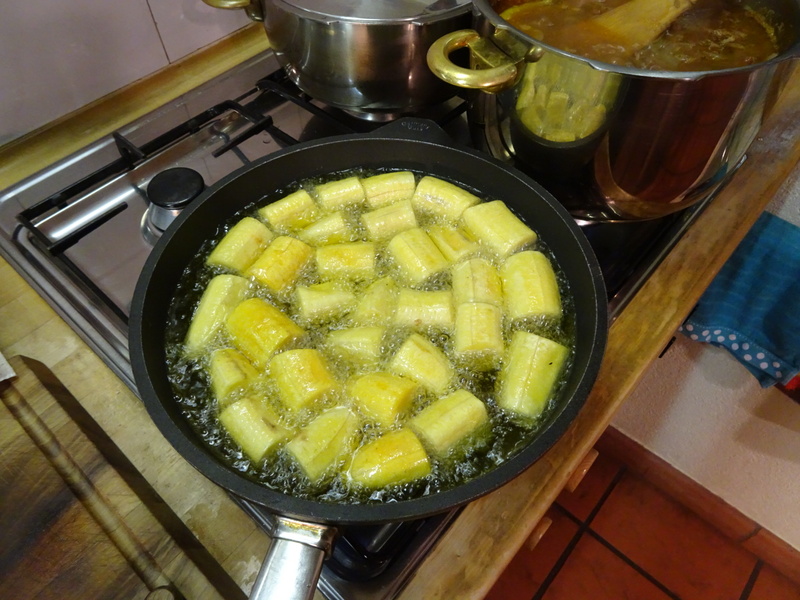 I slide a handful of cut plantains into the pan and peer at them as the warm crackle of oil fills the air. I don’t know how long it takes to fry them, I only know the color, the way the white flesh takes on a golden hue when they’re ready to be taken out, smashed, and fried again. I watch and Doris watches with me. I’m not sure where Fritz is, but Doris and I have been in the kitchen cooking on and off for the afternoon. Fritz had me send her a list of ingredients before we crossed Gotthard Pass and somehow she managed to find green plantains in Switzerland. She found everything else on the list too, garlic, onions, olive oil, green peppers, tomatoes, vinegar, the right cut of meat, and maybe a few more that I’ll keep secret. I take a fork and poke at the plantains, rotating them in the oil, looking at their color, testing their softness with the tines. They aren’t ready yet so I stir the ropa vieja simmering in another pot. I’m happy it looks right. I messed it up back in Hamburg, a little anyway. Risks of cooking by memory and feel, I suppose, but directions and recipes don’t seem right with this kind of stuff. Abuela never used recipes that I saw. She never cooked ropa vieja either, as far as I remember. It was always arroz con pollo with her. She even taught to me to cook it one summer and I still remember the two of us squeezed in her little kitchen stirring the pot as she cracked open a beer and poured it in. I never saw her drink in my life, but she swore that beer was the secret. She always had a few in the refrigerator just in case company came over and she needed to cook. I picked up ropa vieja somewhere else. I don’t even remember where really. If I had to guess, I think it was a cookbook and trying to impress some date in college, but I remember ordering it in restaurants whenever we went down to Miami to visit so it still reminds me of abuela and I try and pour a bit of beer in it because of that. Doris and I made this batch together, chopping, cutting, cooking next to each other in the kitchen. She’d say she just helped a little, but the truth is she made me feel at home from the moment I stepped in the door and that’s as important as any onion to a home-cooked meal. I kept telling her what to look for as we cooked. The onions will look a bit clear here. Just singe the edge of the meat a bit. Let the broth boil on low until it falls apart. Things like that. There is no time, really, I couldn’t say it will take an hour or two. It’s just ready when it looks right. In between we watched Cuban dance videos and listened to a bit of rumba and son. I smash a plantain between two plates. It crumbles and I frown. They need more time. I feel a bit anxious. I can’t mess up Christmas Eve dinner. The next plantain smashes perfectly, flattening into a nice, golden disc. I pull the rest out of the oil and into a pile. Smash, fry, salt, repeat until I have a plate full of golden brown tostones. Fritz comes in with his huge smile looking as excited as when I asked him the day before Gotthard if I could cook when we got back. I still can’t believe she found plantains. The next night, Doris and Fritz cook. Fritz’s brother and his husband come over and the five of us stay up sharing stories, laughing, eating until we can’t eat anymore, then drinking shots from a bottle of alcohol with no label, just a sticker and a date scribbled in ink. It’s Fritz’s dad’s handwriting. The last night, it’s just the three of us again, Doris, Fritz, and me. Doris gives me a bag of chocolate to take with me when I leave in the morning. Fritz can’t stop laughing at how much there is. It’s a solid kilo and half, I think, maybe two, but I don’t mind. I can make it last a while. I can stretch it out past the Swiss border and into Italy. I’ll make a hundred miles, maybe two hundred, before I hold the last piece in my hand. Then I’ll eat it, stare north, and remember Fritz laughing at how much chocolate Doris gave me, remember cooking tostones and drinking from a bottle labeled 1983, remember that perfect Christmas in Aarau, an ocean away from my family, yet still feeling like home. Posted in Europe North to SouthTagged backpacking, christmas, ENS, Europe, Europe North to South, family, featured, hiking, holidays, thru-hiking, tostonesBookmark the permalink. Thank you Fritz and Doris! You are truly angels and great ambassadors for human kind. Come to Florida anytime for the rest of the Cuban menu! When I opened this post up and saw the platanos in the pan I said to myself,”No! No way! In Switzerland?” Amazing that Doris could find all the ungredients for this feast. Reading this sweet post I am thankful for you and Doris in the kitchen together, reminders of your time with Abuela, the laughter and family of this visit with your new friends. Couldn’t be better. I am grateful to all and to the Universe for it, D!